Not a life-changer, but an essential (and affordable) purchase for fans of creative filtering. Awesome results. Versatile. Gorgeous filter. Easy to ease. Good presets. Some developers claim to think "outside the box", but Audio Damage has been known to smash the box to pieces and use the chippings as fertiliser. Its latest plugin, Mangleverb (AU/ VST), however, isn't quite so extreme. Given the name, you're probably (and understandably) assuming that this is a reverb plugin, but get that idea out of your head right away - this is a creative filter with a reverb module attached. There are just three main sections to the interface: Reverb, Filter and Voltage Controlled Amplifier. "Crucially, the Filter and VCA sections can be modulated by an LFO or envelope follower"
The first section is an "80s-style" digital reverb algorithm with a simple control set: Colour, Decay (aka reverb time, including an infinity button, for indefinitely sustained reverb), dry/wet Mix and Pre and Post filter selection. The latter is the key to much of Mangleverb's magic. Set to Pre, the reverb comes first in the signal path, where it'll be fantastically mangled, pumped and modulated by the subsequent modules. Then comes the Filter. This has three modes (low-, high- and band-pass), and it's been spiritually modelled on that of Korg's MS-20 synth. It sounds lovely, with a drive control that can really make it sing, particularly when your source has reverb applied first and the modulators are doing their thing. Finally comes the Master and VCA section. Adjustable parameters include Feedback control (sending the output back to the input), VCA amount control, envelope and LFO modulation depth, and, at the very end of the chain, a Mix control. 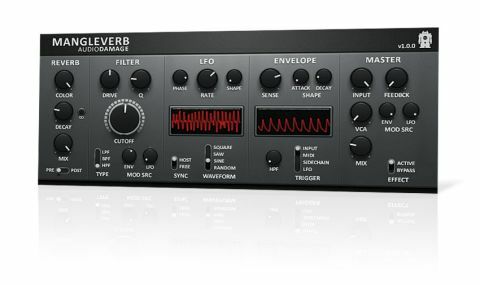 Everything from distorted and pumping reverb to random evolving atmospheres can be achieved with Mangleverb. One of the first things we did was to make an entire rhythm loop - complete with bass, hi-hats, percussion and even a melodic top-line - using just a few channels of the same 4/4 kick drum pattern with a Mangleverb on each. "The presets number only 20, but the emphasis is placed on variety and quality over sheer numbers"
The presets number only 20, but the emphasis is placed on variety and quality over sheer numbers. When browsing the presets, note that the input signal has a huge effect on the result, so the same preset will generate very different results on different sounds - it's worth trying all of them on everything, really, as you never know what you'll get. Some of this is down to the signal strength, so it's also worth tweaking the input level as you move through the presets. Also, we found that many of the presets sounded great when duplicating the plugin and placing it in series directly after the original. One thing we'd really like added is a global modulation offset control (similar to the phase offset for the LFO) to help fit Mangleverb's modulation to the groove of the track. We suggested this to AD and they've obligingly put it on their to-do list. Mangleverb is one of the best Audio Damage plugins in ages. Neither too crazy nor in any way dull, it's a great-sounding, versatile, character- enhancing groove-generator. Whatever style of music you make, we highly recommend it.